This year’s CES has dredged up some memories. I had assumed that as one becomes old they are supposed to become used to memories of a young vigorous person that shared their body and memories leaving little else except some scars and some old stale socks lying around plus 2 or 3 pictures to prove it was in fact not a series of hallucinations. Turns out you don’t get used to it, you just endure. 30 Years ago was our CES: Commodore had the reputation of showing something new every CES and this was a time when a Home Computer meant a Consumer Computer. 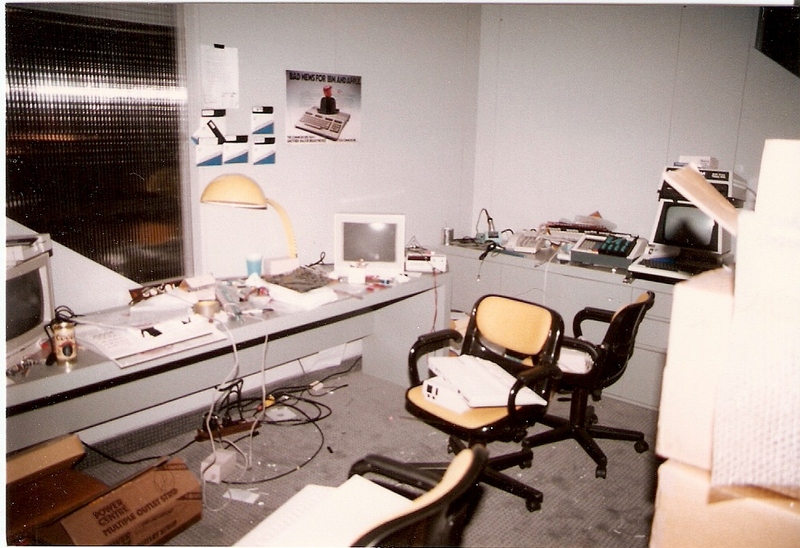 I have written before about how we endeavored to make sure other’s failures didn’t become ours and we did in fact make it, just in time, to the ’85 CES with what became our flagship computer, at least for the next 4 days. When I say made it just in time I am counting people hand carrying the last ten or so homebrewed and MOS cooked 80 column chips either the night before or that very morning. The C128 computers where waiting lined up and open in the room seen below; cases agape much like a row of baby birds waiting on whatever engorgement MOS had come up with for us as the seconds counted down. And then finally we stood on the second floor of our booth (yes they built a 2 story structure for us in a couple of hours the night before) surveying the now working computers; C128’s and the never released LCD machine, when the last “issue” before the doors opened arrived; a Marketing person (panting) telling us of “yet another C128 failure” though she couldn’t actually point to any previous computers that had failed. We wouldn’t let her continue with her complaint until she retracted the previous general statement of failure, more on principle than actual meanness. As with most highly technical in-the-field fixes this one was something to remember. My last act of “the ’85 CES show” became the simple motion of walking up to the “failed” computer station and pressing the key changing the C128 back to 40 column mode, especially important since it only had a 40 column monitor attached to it. Then something happened: We were done. I felt sub-processes actually end that had been consuming both CPU and I/O for months, I was suddenly unencumbered by the next “must fix”. I didn’t have a next task to pop from the stack… the phrase “End of Line” came to mind. I was 24, in Las Vegas and had just delivered one of the major products for the best computer company in the world to the only show that mattered to us. I started walking towards the door with the uncommonly bright Las Vegas sun streaming through the windows. There were lines of people around the block waiting to enter, but the exit was completely unobstructed. I buried myself in Las Vegas in a way that only youth, testosterone, and adrenaline can enable. 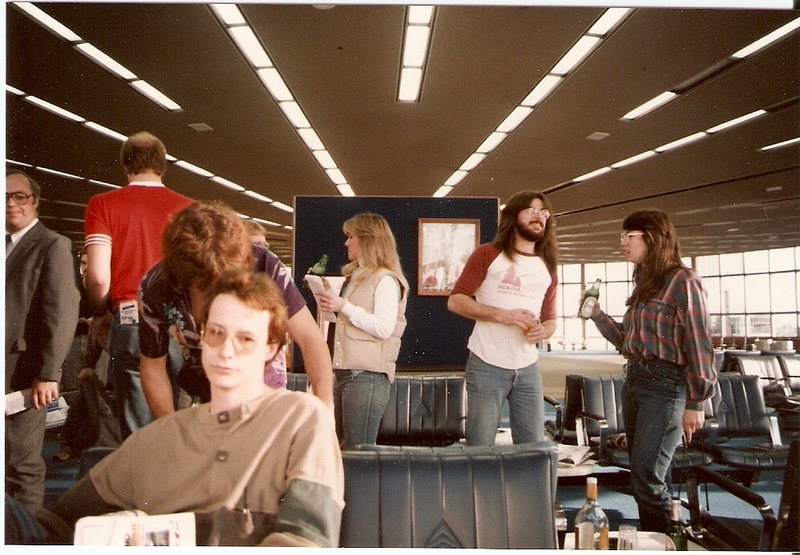 Thats me with the long hair and the girl (Judy Braddick, a somewhat brilliant Game Programmer). Note the bottle of Tequila and empty beer bottle sitting on the table in the Las Vegas airport. Greg Berlin is on the left standing two feet taller than normal humans. (Hedley Davis of Xbox fame in the foreground). It was a good CES. I won’t report here much of what all was done over the next days as I understand that for some things the statute of limitations never truly runs out, but inspired by [Mike’s] reporting of visiting the suites of the companies I will relate one small tale here: I had grabbed my best friend and fellow hardware designer who was the father of the 1581 disk drive, also successfully released on this day, and headed out. With the 6’8” [Greg Berlin] (grandson of the designer of the Curtis Wright P-40 Warhawk) in tow we started hitting the floors of the local hotels looking for the suites of the “important” companies that never managed to personally invite us. We had a secret weapon that opened doors as if bribed; not in Greg’s towering presence but in the simple phrase: “we’re from Commodore”. Doors fully opened that had previously opened only 12-14 inches only to stop on the shoe of the doorman, and 5.25” floppies were stuffed in our pockets like the $20 bills of a VIP trying to impress his date. The suite that comes to mind was that of Electronic Arts (EA). With backslaps and copies of this year’s (and a few of last year’s) C64 game floppies shoved in our pockets we were welcomed like old friends; appointments were made and more than a couple of chugging contests were held. They lost or at least didn’t better us as we were young and full of testosterone. As we made ready to leave the good folk of EA, after making sure that we would swing by their booth the next day (we did), they asked if there was anything they could get for us. This may sound like a strange or gratuitous question but I had already spied the case of Michelob (a beer from the early days of 1 micron silicon) and was pointing to it before the question was fully uttered. EA grabbed the case with no hesitation as I turned to face the door so he could set the case of teardrop shaped bottles on my shoulder for me. Back out into Las Vegas we went with Electronic Art’s beer on my shoulder… It was a good CES. The most popular computer ever sold to-date, the Commodore C-64, sold 27 Million units total back in the 1980’s. Little is left to show of those times, the 8-bit “retro” years when a young long-haired self-taught engineer could, through sheer chance and a fair amount of determination, sit down and design a computer from scratch using a mechanical pencil, a pile of data books, and a lot of paper. My name is Bil Herd and I was that long-haired, self-educated kid who lived and dreamed electronics and, with the passion of youth, found himself designing the Commodore C-128, the last of the 8-bit computers which somehow was able to include many firsts for home computing. The team I worked with had an opportunity to slam out one last 8 bit computer, providing we accepted the fact that whatever we did had to be completed in 5 months… in time for the 1985 Consumer Electronics Show (CES) in Las Vegas. 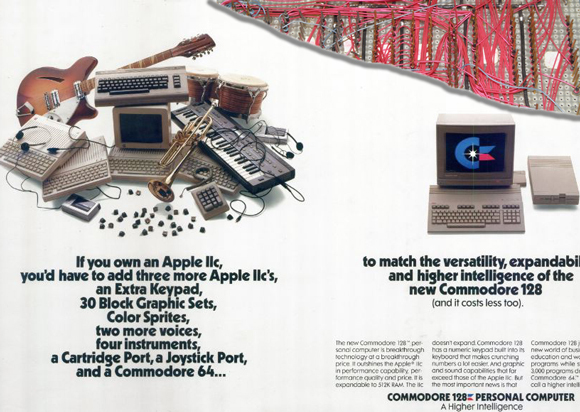 We (Commodore) could do what no other computer company of the day could easily do; we made our own Integrated Circuits (ICs) and we owned the two powerhouse ICs of the day; the 6502 microprocessor and the VIC Video Display IC. This strength would result in a powerful computer but at a cost; the custom IC’s for the C-128 would not be ready for at least 3 of the 5 months, and in the case of one IC, it would actually be tricked into working in spite of itself.